Promotional boxes are ideal for organizations to achieve multiple goals. I know what you're thinking--it's just a box, what objectives does it really need to meet?--but consider the other elements that come into play when it comes to packaging. Packaging is just as important as the product it holds. To make the most of promotional boxes, it's important to start seeing them as the marketing tools they are. A custom box, designed to your specifications, is an investment that will pay dividends in the areas that matter. Brand awareness. Product protection. Increasing name recognition. Enticing buyers. See? A custom promotional box can answer a lot of needs in one literal package. So what's important when creating a custom promo box? Here are the main things you need to have figured into your design. Unique design: Customers are drawn to pleasing aesthetics and design. But what really entices them to pick one off a store shelf, or take a picture to share on social media? Unique designs. Determine what kind of color palette and style best complements your product, and design custom packaging that draws attention and works with the box contents. Surprising content (as in the words on the box, not the product inside): There's a reason that people love reading the messages inside Dove candy or underneath Snapple caps: it's a surprising bit of content that's generally pleasant. Yes, you could just put your company name and the product on the box (and the SKU or UPC), but have fun with it. Your customers will appreciate it. It's an opportunity to do a little extra marketing and share your company values.While we're on the subject of content, don't forget to include the basics of your company. Website, social channels, and a hashtag for customers to share photos of your product and fantastic packaging. 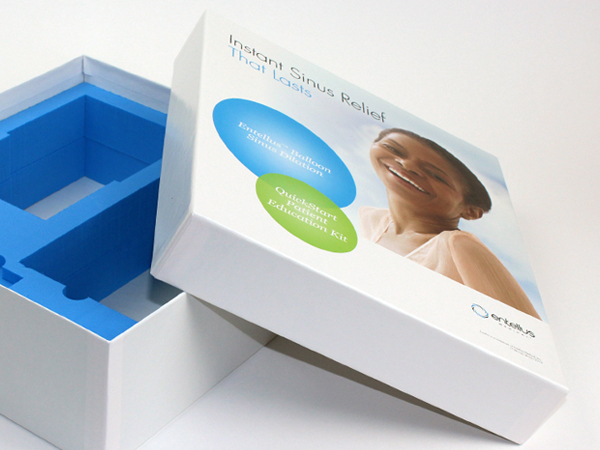 Choose the right insert: Keep your product in place with custom inserts. Consider including thermoformed trays, foam, or other inserts to stop things from shifting and to add a layer of protection. Inserts can also include other printed materials, like instructions. If you're ready to take it to another level, consider a custom flash drive for customers to access instructions, videos, a whole host of materials. Price out necessary upgrades: Leave a little space in your budget to explore potential upgrades. It could mean soft-touch lamination to enhance the feeling of the box. Or handles are ideal to increase mobility. Embossing, foil stamping, and other finishing options can add a literal polish to presentation packaging. Promotional boxes can do double-duty as marketing for your product as well as your business. Make sure it's clear to customers who you are and what you do. And your packaging is a great way to reinforce these messages. Reach out to our sales department today to get started with your optimized custom promotional boxes!